1). Get the gear – Don’t bother to keep awkward sized luggage or suitcases whose wheels don’t work well, or for that matter any bag or backpack that is uncomfortable in any way. If your shoulders or back aren’t comfortable, they will hold more tension. Check Ross or TJ Maxx for affordable, high-quality luggage pieces or your favorite online retailer for discounts. 2). Plan ahead and schedule your massage, acupuncture, and chiropractic appointments for before you leave and after you come back. Your body and mind will rest easy knowing that you will start your vacation or work trip with an aligned and relaxed musculoskeletal system. Accumulating some degree of muscle tension is inevitable with time away from your regular workouts or PT exercises, so having your appointments set up for when you return will ensure a smoother transition back into your routines. 3). Bring a tennis ball, golf ball, and a travel foam roller or The Stick – Ease tension and stress away with these must-have massage tools. You can massage away shoulder and upper-mid back tension or pain with a tennis ball in a pillow case, just sling over one shoulder and lean back against a wall, (or air-plane seat) stay on each tight spot until you feel a lessening of tension, and move on. Repeat with your other shoulder. A golf-ball makes a great foot massage roller for keeping your feet relaxed for all the sight-seeing you’ve planned. While seated, roll out the soles of your feet, not much more than five minutes per foot is usually needed to get results. As with any massage tool, it is possible to overdo it and cause inflammation, so pack some Tiger Balm, arnica gel, or other topical analgesic cream to use afterwards, just in case. 4). Stay healthy – pack vitamin C in powder form (Emergen-C or something similar) and carry hand-sanitizing wipes for airport and airplane chairs and other commonly-touched surfaces. Hand-sanitizing wipes are especially important when travelling with young children to keep them (and you!) healthy and having fun. 5). Bring your own pillow for greater comfort if you have chronic neck tension or pain, pack it in a plastic sweater-saver bag, (available online by searching for “space-saving travel storage bags,” and at most large retail stores) squish out all the air in it and zip it up to save space in your luggage. This is also great for packing bulky sweaters and coats! 6). Stretch out key muscle groups to prevent stiffness and tension while on long flights, at the gate while waiting to board, and in-flight. Before boarding the plane or getting in your car for a long drive, do the angel arms stretch and psoas (pronounced “so-az”) stretch for opening up shoulders and hip flexors which often get tight and stiff on long flights or car trips. For the angel arms stretch, you can do this seated, standing, or lying down. Stretch your arms wide and move them in an arc, like you are making a snow angel, but in the air, against a wall or a bed. The psoas stretch is shown by going to this Youtube link (I also call this one a “kneeling lunge stretch” or a modified warrior one pose): https://www.youtube.com/watch?v=yfswfLuW_tI The stretch I’m talking about starts at about 30 seconds into the short video. 7). 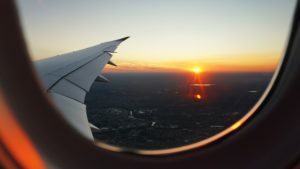 Get good sleep – Melatonin can help you sleep on the plane and at your destination, but sleep-inducing meditations work well too, as I found out when I forgot my melatonin when travelling to Europe last year. I have the Insight Timer app on my tablet and selected the guided meditations for sleep and they worked like a charm! 8). Drink plenty of water to help your body adjust to different climates, elevation gain and / or jet-lag, and keep you alert for all your adventures. Have safe and happy travels, and I look forward to seeing you when you return, and hearing all about your fun adventures!